About 15 minutes after pork has begun roasting, place sweet potatoes on another rimmed baking sheet; drizzle with 2 tablespoons oil. Season with red-pepper flakes (if using), salt, and pepper; toss to coat. Roast on lower rack, until tender, tossing once during cooking, 25 to 35 minutes. In a large bowl, whisk lime juice with remaining 2 tablespoons oil; season with salt and pepper. Add sweet potatoes, beans, onion, and, if using, cilantro; mix gently to combine. 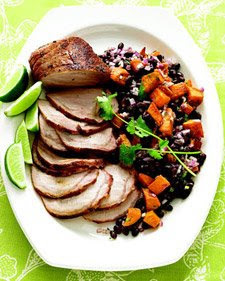 Thinly slice pork, and serve with salad and lime wedges. Jenny! That sounds delicious! I knew I could count on your blog for a fun recipe! I have a few that I need to put out there because they are good...I'm trying yours!